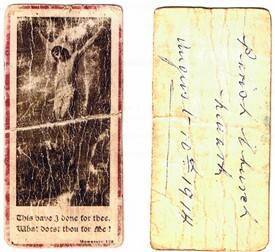 The card Thomas Anderson received at Newark parish church on 10th August 1914 (he dated it in the back) and carried with him throughout the war. Born at Gingley-on-the Hill on 15th September 1895, Thomas Anderson was the son of John and Lizzie Anderson of Gateford Road, Worksop. He was one of the 600 or so Sherwood Foresters who marched from Newark on 10th August 1914, and still in the family's possession is a card he received that day at Newark parish church, which he dated on the back (see illustrations). He carried this card with him throughout training and at the Front. In the trenches he became adept at making grenades from food tins filled with nails and bits of metal, which he charged with a fuse. His idea was that, when thrown, they would explode above the enemy trenches. 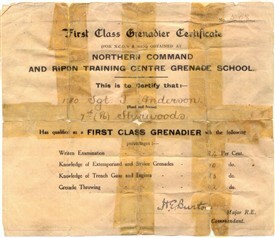 Following two wounding’s received during frontline service, Sgt Anderson was invalided to hospital in London, later re-training as a Grenadier. He then trained officers in grenade technique before returning to the front. 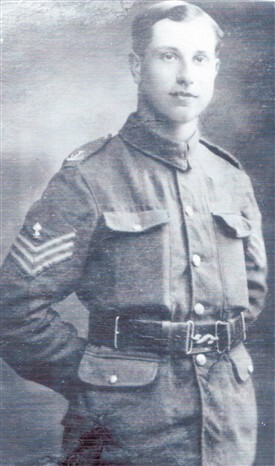 After the war Thomas Anderson returned to Worksop and in 1919 joined the Nottinghamshire Constabulary. He continued as a policeman until his retirement in 1947.